Peanut butter brookie cups are the perfect treat – a brownie and a peanut butter cookie all wrapped up together in a cookie cup! A brownie or a cookie. Such a tough decision. You know, as far as completely unimportant, non-life altering decisions go. But sometimes when I’ve already decided that I am going to make a tasty treat, it’s a tough call. They’re both so delicious. And they both involve chocolate, so you know I’m on board with either! And now I don’t need to choose. Whoever came up with the idea of “brookies” is a complete genius. Have you heard of these? I hadn’t until fairly recently, but decided immediately that it was brilliant. A brownie and a cookie all wrapped up in the same cute little package? What’s not to love? So I took it one step further and made brookie cups rather than cookies. Because I really dislike chilling cookie dough and avoid it at all costs. If I want a cookie I kind of want it now. Not in 3 hours. By then I’ll have realized I really don’t need a cookie and will have found the will power to not have one. Maybe I should be sticking to recipes that need to be chilled…..whatever. Sometimes you just want a cookie. 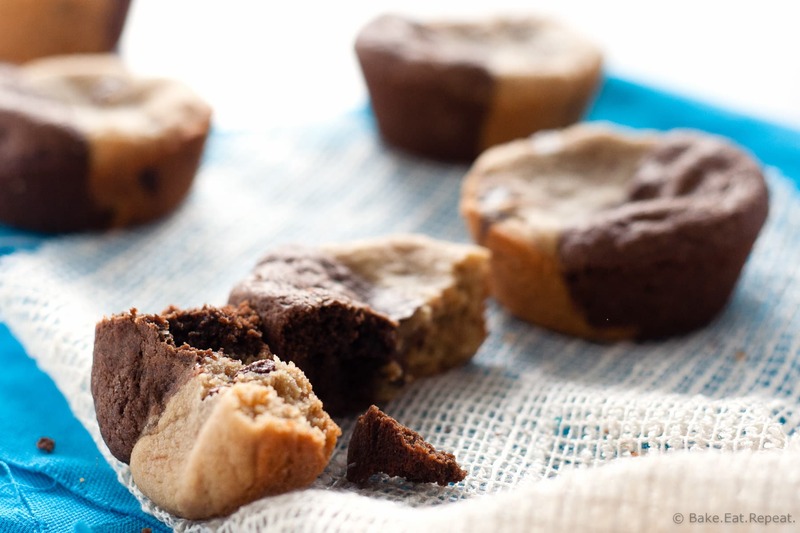 These peanut butter brookie cups do not disappoint. 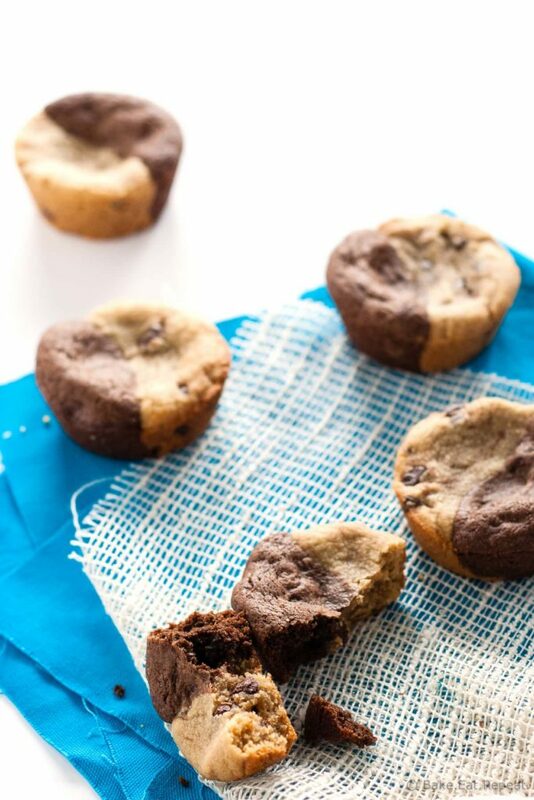 Chewy, chocolatey, rich, decadent cookie cups that are the perfect combination of a fudgy brownie and a chewy peanut butter chocolate chip cookie. They’re also big. As in, you really only need one, and it’s more than enough. If you don’t want giant cookie cups though, they can be made in mini muffin tins as well, but I found those didn’t stay quite as chewy. So if you decide to go the mini muffin tin route, make sure not to overbake them. 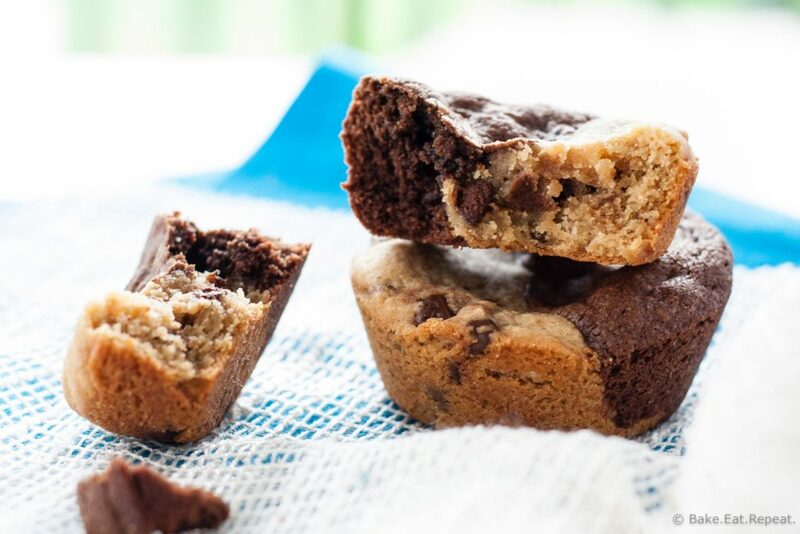 Either way, these peanut butter brookie cups are fantastic. Like I said, brookie=genius. I also shared this peanut butter brookie cup recipe over on Food Fanatic, so be sure to check it out over there! Brookies are seriously my favorite dessert combo EVER! You totally nailed these beauties, Stacey! They look so soft, chewy, and perfect! You're right, these definitely don't disappoint! Who can resist a brownie and cookie together?! AHHHH! I LOVE brookies, but have never made them! These look amazing, Stacey! You need to! So good! Thanks Justine! Love the cookie brownie combo! These look so good! I totally agree! Whoever made the first brookie needs a medal or something! This is my kind of treat! PB&C is always a favorite, especially when brownies are involved. 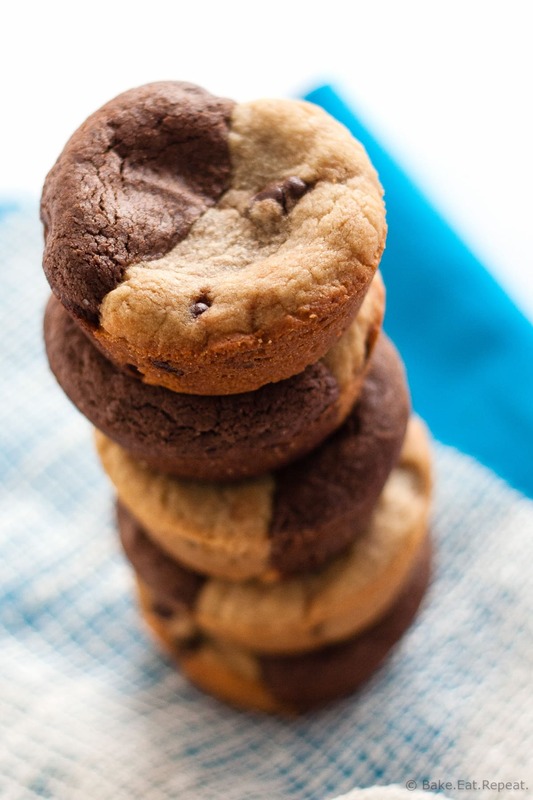 Cookie cups are the best because they're so thick and chewy -- these look delicious! PB&C is definitely a favourite! And yes to cookie cups! Thanks Marcie! Oh, how I adore a good brookie, especially one with PB in a mini muffin shape! You rocked this, Stacey. All my favorite things in one place! Mine too! That's why I loved them so much! Thanks Mir! These brookies look so good! love that you don't have to choose between the two - the peanut butter sounds perfect too! Mmm these brookies are definitely perfect for when you can't decide between a brownie and cookie. I love the peanut butter flavor, Stacey! So perfect to munch on! The toughest of decisions! I love them both equally, so a brookie is the perfect solution :-) These look amazing! I'll take the entire batch! I've never had a brookie before, but I know I'd love them. I mean, what's not to love about cookies and brownies coming together to make one fantastic treat?! You know what's NUTS? I've never had a brookie I KNOW. I am totally missing out on ALL things life. AND THESE? I mean chocolate and peanut butter? I NEED THEM! Too large?! Ha! These look like absolute perfection! Hahaha, well not too large for me...but I thought people with less of a chocoholic tendency might not agree! I agree with you - perfection! :) Thanks Melanie! Who has to choose when you solve the debate and we can have both! Right? Why choose? Brookies are just the perfect cookie! YUM!! How great that you don't have to choose! I could go for one of these right now! I have a feeling I'd have a problem stopping at just one though! Exactly! I hate chilling cookie dough, I'm far too impatient for that! Thanks Medha!